Our love for Harris Tweed goes back many years. In 1981 we had a particularly memorable visit to the Outer Hebrides when we were shipwrecked on St. Kilda. It was a harrowing experience, and when we were eventually rescued we spent some very happy days exploring the island of Harris and visiting the weavers along the Golden Road. They all wanted to hear about the shipwreck, and we were plied with tea and cake in every house as the islanders are famous for their hospitality. In those days there were still a few weavers who spun and dyed their own wool in the time-honoured fashion, and we were lucky enough to meet them and buy some of their tweeds. The laborious process of scraping the grey-green lichen known as "crotal" off the rocks and boiling it in a cauldron with wool from their own sheep was still being done by some of the crofters. The result was a rich reddish brown yarn which never quite lost the distinctive smell of the crotal, a rather sharp scent reminiscent of the rocks and the sea. Greens and yellows were achieved by using local plants such as heather, ragwort and flag iris. We will never forget that first visit to the Golden Road, the smell of peat smoke in the air, the little loom sheds with the lobster creels outside, and the gentle lilting voices of the islanders. Of course we came away completely in love with Harris Tweed, our car laden with bolts of cloth. More visits followed, in between filming and farming. As well as visiting our friends on Harris we went to the mills on Lewis and saw the amazing variety and depth of colour that could be achieved. By the end of the decade an idea had taken shape. We made it our mission to use this fine hand-woven cloth in new ways, combining innovative design with the best of British craftsmanship. In 1992 Glenalmond Tweed was launched with our own unique range of waterproof Harris Tweed bags and luggage. We exhibited them at an international trade fair in Paris, and the collection was an instant success, gaining us orders from all over the world. We are happy to say that after all these years our enthusiasm for Harris Tweed and our commitment to British craftmanship remain undiminished. We hope you will enjoy our collection and share our love of Harris Tweed. For thousands of years the inhabitants of the rocky windswept islands known as the Outer Hebrides have been weaving woollen cloth to keep them warm and protect them from the elements. When Stornaway airport was built in 1941, a burial chamber estimated to be around 2,000 years old was uncovered. Among the tools discovered in it were a whorl-stone used for spinning wool and a weaving comb used to press the weft yarn firmly between the warp yarns on a loom. The origins of weaving in the islands may be lost in the mists of time, but the designation of "Harris Tweed" for the hand-woven cloth the islanders called "Clo Mhor" (the Great Cloth) is easier to date. In the early 1840's the islanders suffered a devastating potato blight which left communities destitute and starving. Following the death of her husband in 1845, Lady Dunmore inherited a 150,000 estate on the Isle of Harris. Seeing the miserable hardships the islanders were suffering, she gave up her position of Lady of the Bedchamber to Queen Victoria and set about helping her tenants. As well as offering financial assistance, Catherine Dunmore encouraged cottage industries such as spinning, knitting, and weaving. Around 1850, the Countess began introducing finished tweeds to her aristocratic circle of friends and establishing connections with Edinburgh and London markets. Since the Industrial Revolution, hand-woven cloths were rare and valued, and Harris Tweed soon became a renowned and sought-after fabric. In 1906, a man in London was convicted of selling a machine-made cloth and passing it off as Harris Tweed. The time had come to protect the name of Harris Tweed and safeguard the livelihood of the islanders. 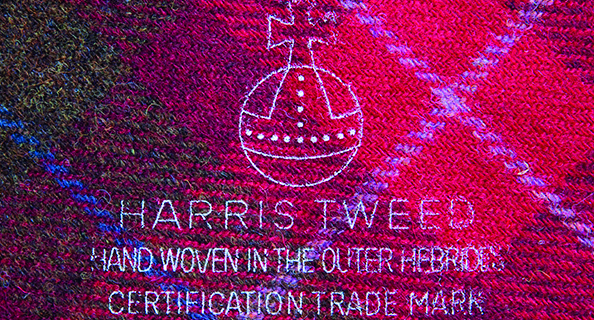 The Harris Tweed Association was formed in 1909, and the famous "Orb" trademark was registered in 1910. To this day, the tweed is stamped with the Orb mark to certify the authenticity of the cloth, still handwoven by islanders in their own homes from pure virgin wool.